i am new to this forum and would like to tave the opportunity to thank you all for sharing all your knowledge with newcomers like me. 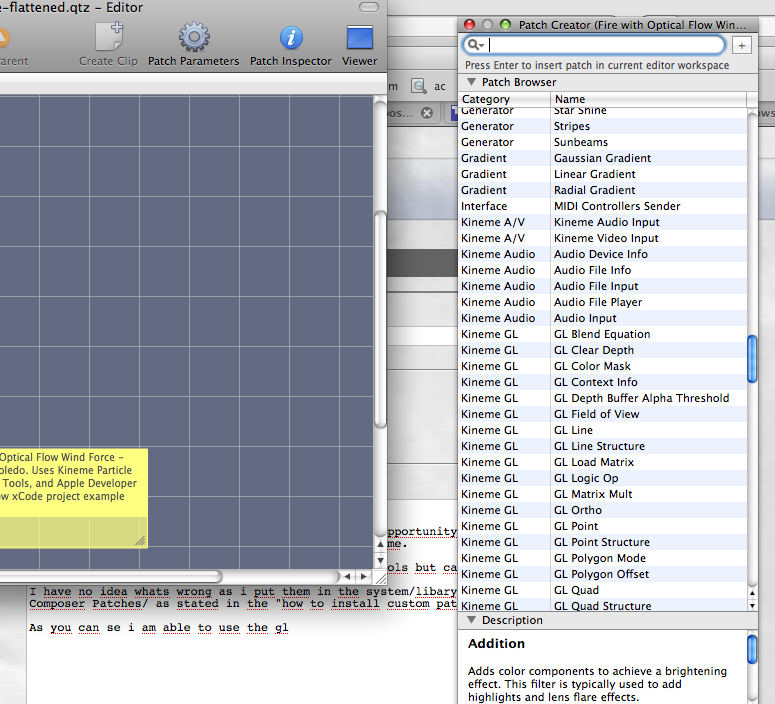 I am eager on starting playing with the particle tools but cant get it to work. I have no idea whats wrong as i put them in the system/libary/Graphics/Quartz Composer Patches/ as stated in the "how to install custom patches". As you can se in the attached files i the kineme gl stuff show up so i believe that i put the plugins in the right place. 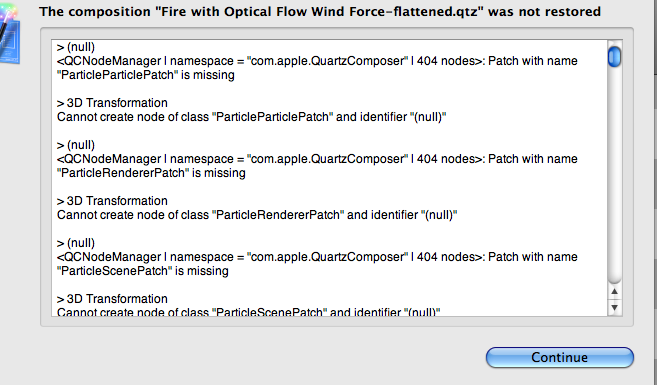 I get this error messages when trying to open the Kineme Fire with Optical Flow Wind Factor SAMPLE which i downloaded from kineme. Oh by the way im on a macbook pro with Mac OS X 10.5.6. thanks in advance. Remove Kineme.plugin -- that's a Tiger-era plugin that shouldn't be used anymore. Remove all the stuff you added to /System -- DO NOT use that folder (it pisses off OS X's setup) -- use /Library, or even better, ~/Library (the Library folder in your user directory). Did you restart QC after installing the plugins? QC only loads plugins when it starts. Is anything printed in Console.app? Also, you are referencing something I uploaded which contains a standard API plugin... the opticalflowdownloader plugin... THAT one needs to be downloaded in the plugins folder at the file path Chris references, whereas the particle tools needs to be placed inside of the patches folder. Finally found some time to go through your instant answers, after removing the kineme.plugin it started working.